Time lapse of Endeavor's "flight" through L.A. 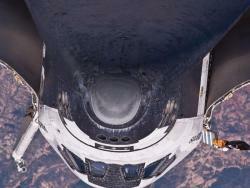 Here's some pretty cool time lapse photography of space shuttle Endeavor's trip through the streets of Los Angeles. 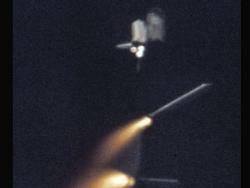 STS-1: In this image, the two solid rocket boosters are aglow after being jettisoned.Courtesy NASAApril 12, 1981 was the date of the first space shuttle launch. I remember it. On April 12, 1981, astronauts John Young and Bob Crippen launched into space on space shuttle Columbia on the STS-1 mission--NASA's first mission aboard a reusable spacecraft. 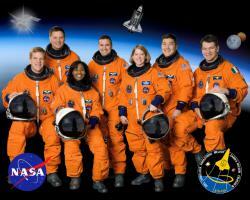 STS-1 was NASA's first manned mission since the Apollo-Soyuz Test Project in 1975. Lighting Up the NightCourtesy Tom MolerLights and space shuttle Discovery are reflected in the water as it rolls to the pad on its final planned mission to the International Space Station. In preparation for its last planned mission to the International Space Station, shuttle Discovery was lowered onto its external fuel tank and solid rocket boosters in High Bay 3 of the Vehicle Assembly Building at NASA's Kennedy Space Center in Florida. The lift and mate operation began Sept. 9 and wrapped up early Sept. 10. 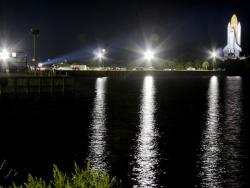 On Sept. 21, 2010, Discovery completed its last planned trip to the launch pad at 1:49 a.m., leaving the Vehicle Assembly Building at about 7:23 p.m. on the slow, 3.4-mile crawl to the pad. Discovery, the oldest of NASA's three active orbiters, first launched Aug. 30, 1984, on STS-41D and is being readied for the STS-133 mission to station. Liftoff is targeted for Nov. 1 at 4:40 p.m. EDT. Atlantis Lifts Off: Space shuttle Atlantis lifted off from Launch Pad 39A at NASA's Kennedy Space Center in Florida on the STS-132 mission to the International Space Station at 2:20 p.m. EDT on May 14.Courtesy NASAI have been following with interest the last flight of the space shuttle Atlantis. I subscribe to the NASA image of the day site, and since the launch have been providing some cool photos of the mission that are below. Russian Rassvet Mini-Research Module along with an Integrated Cargo Carrier-Vertical Light Deployable (ICC-VLD). An interesting tidbit: On board Atlantis is a 4-inch long wood sample of Sir Isaac Newton's apple tree. This piece is from the tree that supposedly inspired Newton's theory of gravity.The wood is part of the collection of the Royal Society archives in London, and will be returned there following the flight. Neat. Also weird. 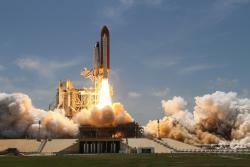 NASA is now entertaining offers for its three space shuttles – Discovery, Atlantis and Endeavour – that are scheduled to be retired in 2010. The estimated $42 million price tag includes $6 million in transportation costs to fly a shuttle to atop a 747 to the nearest major airport near the purchaser. Click here for more details. One of the three will likely be put on display at the Smithsonian's Air and Space Museum in Washington, D.C. Where and how would you like to see the other two be repurposed? 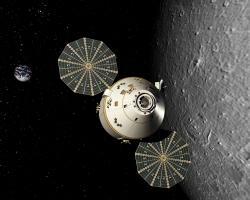 The Orion crew exploration vehicle: This artist's rendering of Orion crew exploration vehicle in lunar orbit. (Depicts obsolete configuration.) Image courtesy: Lockheed Martin Corp.I was emailed this story today by a co-worker that had the subject line, "No Orion in 2013" which made me think something was going down with the constellation of Orion - but that's not it. 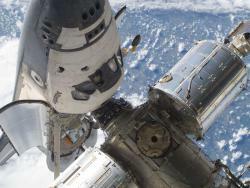 Officials at NASA announced yesterday that they have abandoned plans to get the Orion crew capsules, the replacement for the retiring U.S. space shuttles, into service by 2013. 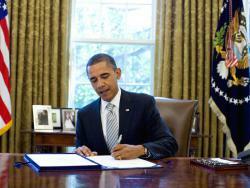 Officials site a lack of additional funds and technical issues as the cause. 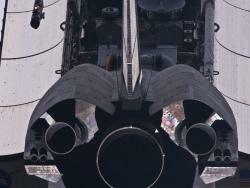 The original plan was to get the new launch systems in place by 2015, but since the shuttles are expected to retire in 2010, NASA was pushing to close the gap. They are now aiming for 2014. 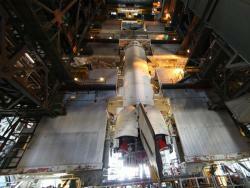 NASA will depend on Russian launch vehicles to get crews to the International Space Station in the interim. The crew of STS-120: Image courtesy NASA.NASA space shuttle mission STS-120 this October will be brining more to the International Space Station (ISS) than the Harmony module, which will provide attachment points for European and Japanese laboratory modules. In addition, it will bring the original prop lightsaber from Star Wars Episode VI: Return of the Jedi. The prop is being flown to the ISS to commemorate the 30th anniversary of the Star Wars franchise, which began with 1977’s Star Wars Episode IV: A New Hope. 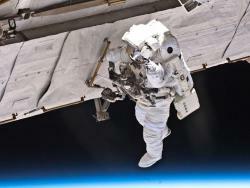 As both a Star Wars nut and a fan of most things space related, I read this story with mixed feelings. Is this more a PR opportunity for Star Wars or NASA? Star Wars can almost do no wrong in my mind (except possibly with Jar-Jar Binks) and I wonder if this story, while giving props to Star Wars, isn’t really more of a boost to NASA for being associated with something cool like Star Wars. Personally, I think a lot of stuff NASA does is cool but I know a lot of people who could care less about NASA and space in general (I call them “space haters”). And, hey, its something fun. I’ve read a few blogs that are accusing NASA of wasting funds on this, but I doubt this cost NASA much in terms of money, and probably has exposed them in a fun and positive light. I’m all for it.